Three of the featured homes welcoming you inside during the 2014 "Come Home to Lakewood" Home and Garden Tour. The properties on the tour are chosen from community nominations. Some of these may be homes and businesses you've driven past and always wondered what they looked like on the interior! Don't miss your chance to experience the properties that give our community its unique character. Advance sale tickets for the House Tour are $25. Tickets can be purchased by mail, at the Oldest Stone House, online at museum@lakewoodhistory.org, or at the retail outlets listed below beginning July 30th. A limited number of tickets may be available the day of the tour at the Nicholson House for $30. You can kick off your "Come Home to Lakewood" tour weekend Saturday, September 6th at the Patron Party, held at a stunning lakefront Tudor. Party tickets can be purchased online, by mail, or at the Oldest Stone House during business hours. 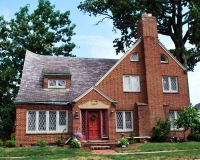 For more tour and benefit information, contact the Oldest Stone House at 216.331.7343. Beck Center for the Arts 17801 Detroit Ave.
First Federal of Lakewood 14806 Detroit Ave.
Geiger’s Clothing and Sports 14710 Detroit Ave.
Rozi’s Wine House 14900 Detroit Ave.